This little picture book has been making the rounds of child lit bloggers: Big A little a, Book Buds, A Fuse #8 Production, Kids Lit. The Plot: The human narrator explains: "Last night, I found a penguin. He told me he'd been flying. But . . . penguins can't fly." And so begins the story of the man who befriends the penguin and the penguin who tries to take flight. The Good: This book, translated from the German, is delightful. I love some of the sentences: "He looked so heartbroken that I believed him." I also loved the pictures; simple black and white pencil drawings, with the occasional use of one color to highlight something. It reminded me of the picture books I had loved as a child, such a the original We Were Tired of Living In A House. I always think of drawings like this as being for "real" things; so they are a serious balance to the sometimes silly things that the penguin and man do. As Fuse #8 points out, those who look at this book and say "but penguins can't fly" or see animal cruelty in the various attempts of the penguin to take flight don't get it. This isn't a realistic book to put in amongst non fiction; this is a book about believing in something. And it's funny! The man and the penguin "even studied books about flying," and as the man looks at thick tomes the penguin reads a Super Man comic book. One attempt is the man with a bow and arrow, except the penguin is the arrow. The humor is similar to The Book Of Bunny Suicides. 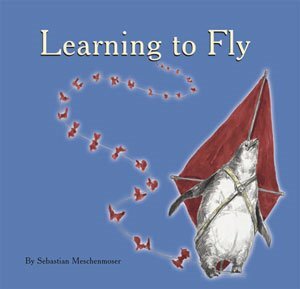 LTF is NOT about a penguin learning to fly; it's about belief, and being inventive, and getting a chuckle out of the serious not-serious attempts. I think this would work best one on one, so that the pictures can be discussed. The text is simple enough for a beginning reader; the pictures, as noted, are a bit "older" so that this is one of those picture books that can be used with older students. I read this book about a month ago -- and it stayed with me. And it held up on rereading. And I noticed new things in the deceptively simple pictures. You know what that means, don't you? Yep. It's being added to my top books of 2006. Edited to correct typos from blogging with child on lap.